On Feb. 29, the 21-year-old sophomore served as a guest speaker at Rare Disease Day, hosted at Cal State East Bay’s Concord campus, where she attends classes. For Bueso, the topic is her daily reality. Since early childhood, she has been living with a rare condition called Mucopolysaccharidosis Type VI (MPS VI), a family of diseases caused by enzyme deficiencies. Only a few thousand people in the world suffer from the genetic disease, which often can stunt growth and lead to numerous side effects, including blindness and added pressure in the skull or spinal column. She is the founder and organizer of the campus event, which started last year due to her advocacy. In fall 2014, when she arrived at CSUEB, Bueso approached some classmates — many of whom were majoring in the medical field — and asked them to become involved. She made calls, sent emails and set up a table for donations. Since the National Organization of Rare Disorders (NORD) and Rare Diseases Europe (EURODIS) started Rare Disease Day in 2008, thousands of such events have taken place around the world. Isabel’s remarkable journey started in Guatemala, where she was born. As a baby, she was plagued by infections during her first year of life. Her parents knew something was wrong. They flew her to Miami, where she was examined by two physicians and took a battery of tests. It was there that she was diagnosed with MPS VI. Doctors suggested she be taken to St. Jude Children’s Hospital in Memphis, Tenn., where a match for a bone marrow transplant would be sought. For the next four years, Isabel flew from Guatemala City to Memphis bi-annually for tests. However, a bone marrow donor was not found. Undeterred, Karla Bueso did not give up. She emailed the hospital every month, pleading that her daughter be accepted into the program. Meanwhile, Isabel’s condition had worsened. She was getting tired more often, her hands were clasping shut, and she had recurring headaches. Finally, the hospital agreed to admit her. It was the last clinical trial approved by the FDA. The results were dramatic for Isabel — the enzyme replacement sessions eliminated much of the pain and respiratory infections associated with the disease. The family said they were given only seven days to decide. Karla, an executive at a public relations agency in Guatemala, and her husband Alberto, a computer engineer, boldly decided to relocate Isabel and her older sister Ana (now 23) to the Bay Area and start a new life — a life that would measurably improve Isabel’s rare condition. Settling in Concord, Bueso continued her treatments at Children’s Hospital Oakland and attended public school. Then in 2008, she started suffering from neck compression caused by the curvature of her back and underwent surgery. The procedure caused paralysis from the chest down, confining her to a wheelchair. Bueso still undergoes enzyme treatments every Friday at Children’s Hospital Oakland. Proud of having opened the door for other MPS-inflicted patients like her, each year she supports the hospital’s annual fundraising radio-a-thon by appearing as an interview guest. She also shares her passion for dancing with young children in the various wards at Children’s Hospital. She is involved with the non-profit organization, Dancin’ Power, where she receives lessons, hoping to become a dance teacher one day. Much of what she does is made possible by her loving mother, who has devoted her life to assisting her daughter in chasing her dreams. Beyond its support for rare disease awareness, Bueso says Cal State East Bay has been the perfect fit for her, both academically and socially. She particularly praised the Student Services department, which has provided special timesaving computer software (Kurzweil Education) that digitally transposes her books to address some of her physical challenges. As a result, Bueso thrives in the classroom. She was recently invited to join the school’s Honor Program, which requires a 3.6 GPA, and she is also considering Cal State’s study abroad program. However, she has yet to declare a major. Karla Bueso knows anything is possible when it comes to her daughter. 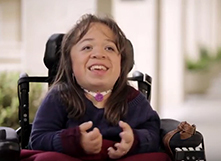 Learn more about Isabel in this video.